Friends University’s main campus is located in Wichita, Kansas. The beautiful, park-like expansive campus exists in a quiet residential community. The historic and architecturally distinctive Davis Administration Building is the focal point of our wooded campus that features well-maintained buildings and beautiful landscaping. Our students value the small-town community feeling on our campus, but also enjoy going to college in Wichita — Kansas’ largest city. Not only has Wichita been named an All-American City four times since 1962, it also ranked among the top 32 cities nationally for quality of life. In fact, Money magazine recently named the Wichita community a Top 10 Best Place to live (right above New York City). If you’re looking for undergraduate or graduate programs in Kansas, these rankings communicate affordability, short and easy commutes to work and a high level of public safety for your family — attributes you simply can’t find in most metro areas. Wichita’s diverse business community truly prizes and encourages entrepreneurship and innovation — values confirmed by companies like Pizza Hut and Coleman Companies, which got their start right here in the middle of the heartland. If you are interested in bringing an external group to use Friends University facilities for meetings, camps, concerts, weddings or other events, please contact Paulyna Webber, HR Coordinator, via events@friends.edu or fill out our External Events Request form. Friends University is an active, private campus twelve months a year. While we are pleased to welcome guests to our campus, the University must first and foremost serve its students, faculty, and staff. 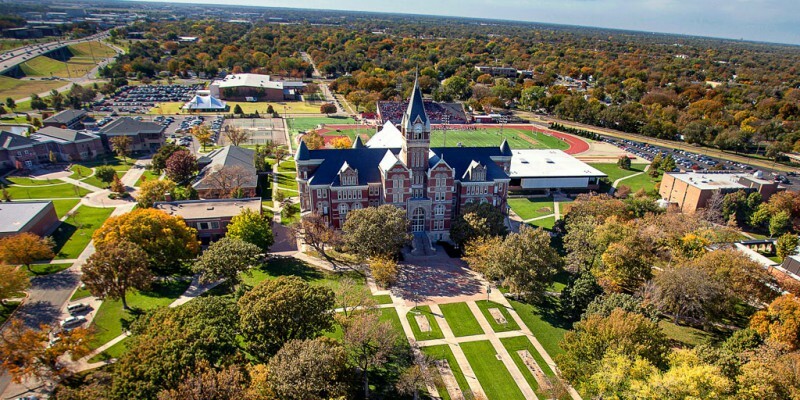 Use of Friends University facilities should be for purposes that align with its mission, vision, and values. University facility access is limited to approved groups—requests that conflict and/or interfere with on-campus activities or which are not in the best interests of the University will not be granted. Before inquiring about your event, please review the Facility Use Information for fees, requirements, catering information, and more. If you have any questions, please contact Paulyna Webber: events@friends.edu or 316-295-5804. From I-135 travel to Kellogg (Hwy 54) and take West exit. Travel west on Kellogg and exit at Seneca. Turn right on Seneca into the left lane for an immediate left onto University Ave. Travel west on University Ave. to Hiram. Hiram ends at the campus. From I-35 travel to Kellogg (Hwy 54) and take West exit. Travel west on Kellogg and exit at Seneca. Turn right on Seneca into the left lane for an immediate left onto University Ave. Travel west on University Ave. to Hiram. Hiram ends at the campus. From Turnpike take Kellogg (Hwy 54) West. Travel west on Kellogg and exit at Seneca. Turn right on Seneca into the left lane for an immediate left onto University Ave. Travel west on University Ave. to Hiram. Hiram ends at the campus. From Hwy 54 (Kellogg) travel east to the Edwards/Meridian exit (the one after West St. exit). Drive through the Edwards/K-42 intersection and proceed to Meridian. Turn left at Meridian. At Kellogg Drive (first right) turn right and onto campus.